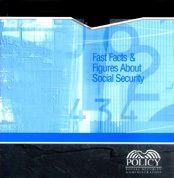 The original print and web versions of this report contained an error in the narrative description of the “SSI Beneficiaries, 1974–2001” charts in the Children and Social Security section. The number of blind and disabled children receiving SSI payments in 1996 was incorrect. The correct number (955,000) now appears in the web versions of this report. The Social Security program, from its beginning to the present, has been the subject of serious discussion and sometimes vigorous debate. Today, as we consider the future direction of Social Security, we need to base the discussion on information that is factual, informative, and easy to comprehend. Fast Facts & Figures answers the most frequently asked questions about the programs SSA administers. It highlights basic program data for the Social Security (retirement, survivors, and disability) and Supplemental Security Income programs. Most of the data come from the Annual Statistical Supplement to the Social Security Bulletin, which contains more than 250 detailed tables. The information on the income of the aged is from the biennial data series Income of the Population 55 or Older. Information from this data series that appears in Fast Facts & Figures is updated annually. The faces that emerge from these facts and figures illustrate the importance of Social Security for our oldest and our youngest citizens. In all, more than 50 million people receive some type of benefit or assistance. Alexander Estrin and Patrice Cole prepared this chartbook. Emil Loomis designed the chartbook and prepared the print version for publication. Celine Houget edited the text and graphics, and Laurie Brown prepared the Web versions.